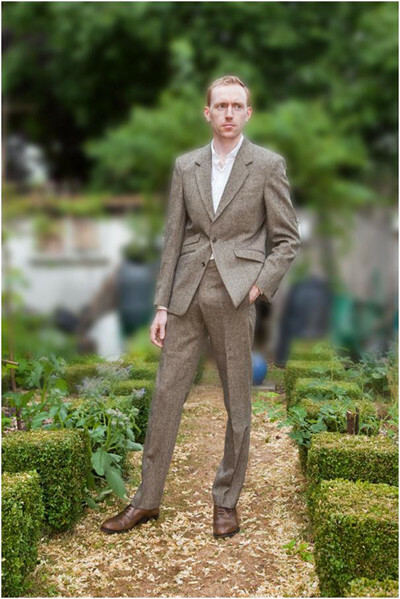 A Henry Herbert suit, made with the ‘mystical’ Harris Tweed. A finely cut suit that looks striking on the young man wearing it – Marcus Jaye, Creative Director of The Chic Geek. The remarkable Harris Tweed is the only fabric in the world that is governed by its very own Act of Parliament, 1993. The Act ensures that all cloth certified with the Harris Tweed Orb complies with the definition in the Act. Made from a lightweight tweed, the suit is made and cut in England. As much of the suit as possible is hand tailored. As with every suit we make, unless you choose our Express service, the suit will take 8-9 weeks to make – we have a half way baste fitting and then a forward baste fitting, before the suit is finished and delivered. The cloth was from British made cotton, with working buttons and horn buttons. See also: harris tweed hebrides, harris tweed suit, mens tweed suit, tailored tweed suit. Tweed Suit- The Vintage Look. A Henry Herbert tweed suit, made with the mystical Harris Tweed. A finely cut suit that looks striking on the young man wearing it.